The guys @ SANS are putting daily articles on 31 different ports/services/protocols/applications during October, the list is very good and the comments of the readers also worth checking. OnGuard: tips, games, and videos. Setup.exe file is downloaded to the machine, the anti-virus detection rate of that file is below 35%. Here is another list of infected domains used in Koobface campaign. You musst see tthis vvideo nnow! It'ss the bbest one!! You mmust see tthis viideo now!! It'ss the bestt onne! You mustt see thhis vvideo now!! It''s the bbest one!! It is using a slightly different subject every post. The above sites are using different languages, some using php, or vBulletin. For Facebook users, this guide is a must read. Identify the prevalence and probability of different vulnerability classes. Compare testing methodologies against what types of vulnerabilities they are likely to identify. White box method security assessment statistics. 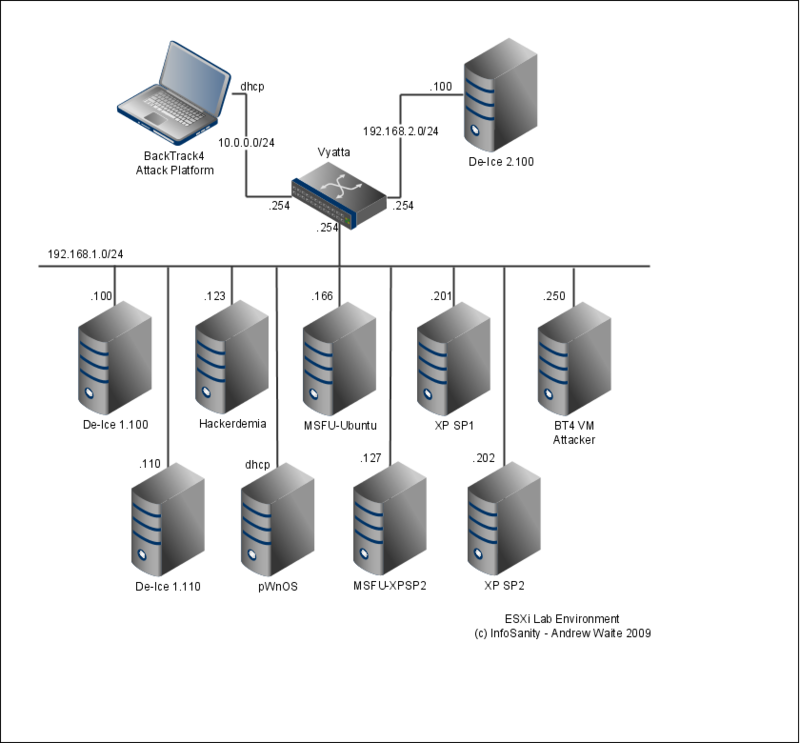 A couple of recent blog posts by Andrew Waite, Infosanity, has put some details on implementing a full visualized lab, using VMWare ESXi with Vyatta (virtual FW and router), De-ICE PenTest LiveCDs , and BT4. Keep your Firefox Plugins up to date! Mozilla has just released a web page that will check your main plugins for updates, all what you need to do is visiting this page. Mozilla plan for automatic updating of Firefox plugins, that is a major step in fighting malware propagation methods. U.S. and Egyptian authorities are arresting dozens of people in an identity theft ring. The gang used phishing attacks and successfully managed to get financial and personal information from thousands of victims. Expected loss is around 2 million US$. The story is alarming in the middle east, for the number of charged people (47 in Egypt, 33 in USA), and the ease of attacks. The indictment is available here. Egyptian Coverage in Arabic, here and here. Improving data visualization for the public sector project, an amazing source of visualization techniques, articles, tools, and samples. Smashing Magazine also has an article on useful resources for visualization. Not to mention SecVis, the most useful source for sharing visualization ideas. Gephi is a very good interactive visualization tool. BRUCON security conference ended 2 weeks ago, check the material here.